The Laser Grenadiers are the latest generation soldiers of Axis armies, so far restricted to the formations of the infamous BlutKreuz Korps. They carry the dreaded Laser Weapons, deadly to Infantry and Vehicle alike. A squad of five Laser Grenadiers includes four soldiers equipped with a Laser Gewehr (Laser Rifle) and one soldier armed with a Laser Werfer (Laser Gun). As these guns are rare and quite difficult to maintain, they are now reserved to the Korps but might someday be found in the hands of all Axis soldiers. 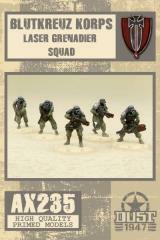 This reference comes with its own Dust 1947-unit card, for the BlutKreuz Korps Faction. Like all regular Dust 1947 miniatures, it comes already assembled and primed. It's ready for the battlefield, or for painting, as you wish! You can directly paint over on it, since the priming serves as an undercoat and is compatible with any type of paint.